Ugh. I had to have minor toe surgery today. 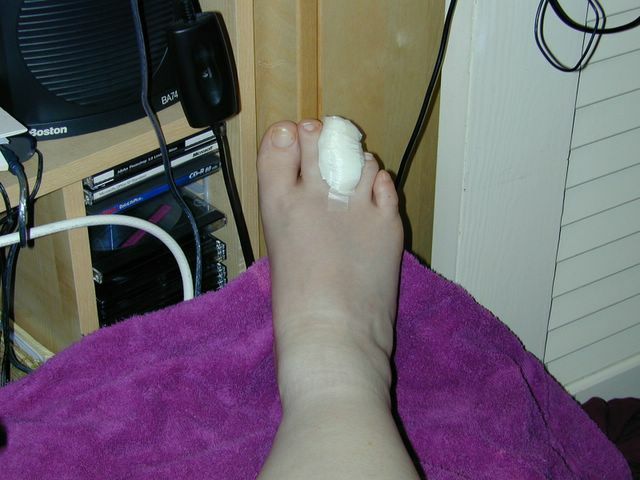 My podiatrist, Johnny Rotten, told me I really, really would want to take a Tylenol before the anesthetic wore off. Man, he was right. While he tortured my poor toe (and I pretended to read my copy of the Washington Post so I didn't have to see what he was doing), we talked about the rather unfortunate demise of the wife of a local syndicated radio host here in DC. She was out at the beach on Sunday, and she was hit head-on by a young man in an SUV who swerved to miss a 10-car pile-up, crossed the median and turned her Lexus sedan into twisted wreckage. This lead to a conversation about car accidents in general (and I told him about all the people I'd seen ejected from cars back in Russia - no seat belts + erratic driving = bodies on road more often that you'd like to imagine. Damn, I saw a lot of dead people in Russia. A lot.) This then lead to a conversation about being held at gunpoint, which is another super-fun memory of Russia. Weird conversations for foot surgery. Foot (with monkey bones), bandaged toe, and messy computer area. No treadmill for a week. No exercise bike for three days. Man, I really, really wish I'd taken the damn Tylenol when he told me to... cuz this sucker is throbbing. Dang it. Back to the sofa. I can still catch the last 20 minutes of an old Charmed episode on TNT, land o' reruns. Oh, and Javier - if it's the one where you put facial hair on Shannen Doherty and turned her into a man - you're paying for my therapy. Hope the toe has stopped hurting and that you can return to your regular life soon. I hope your toe feels better really soon! I watched that episode of Charmed recently. It's quite disturbing! Analyst-ka - you should visit the blog of Javier Grillo-Marxuach. He's the guy who wrote that episode of Charmed back in the dark ages. He's now a producer/writer on "Lost", which is a great show. If it isn't on in the UK yet, it will be. Doesn't it sound rather like a line from Edgar Allan Poe? Any savvy techies out here? Need help! Bethesda, Maryland. CVS Parking Lot. 9:47 p.m.
Have you seen my car keys? Holy crap! Madness is releasing a new cd!! Matthew Lesko is following me!!! Where was the substance found, Mr Pakenham?